Back in the first moment of the universe, everything was hot and dense and in perfect balance. There weren't any particles as we'd understand them, much less any stars or even the vacuum that permeates space today. The whole of space was filled with homogeneous, formless, compressed stuff. Then, something slipped. All that monotonous stability became unstable. Matter won out over its weird cousin, antimatter, and came to dominate the whole of space. Clouds of that matter formed and collapsed into stars, which became organized into galaxies. Everything that we know about started to exist. So, what happened to tip the universe out of its formless state? Scientists still aren't sure. But researchers have figured out a new way to model in a lab the sort of defect that could have caused the great unbalancing of the early universe. In a new paper, published today (Jan. 16) in the journal Nature Communications, scientists showed that they can use supercooled helium to model those first moments of existence — specifically, to re-create one possible set of conditions that may have existed just after the Big Bang. That matters because the universe is full of balancing acts that physicists call "symmetries." Some major examples: Physics equations work the same way both forward and backward in time. There are just enough positively charged particles in the universe to cancel out all the negatively charged particles. But sometimes, symmetries break. A perfect sphere balanced on the tip of a needle falls one way or the other. Two identical sides of a magnet separate into north and south poles. Matter wins out over antimatter in the early universe. Specific fundamental particles emerge from the formlessness of the early universe and interact with one another via discrete forces. Need proof? It's all around us. Every table and chair and galaxy and duck-billed platypus is evidence that something tipped the early universe out of its early, flat state and into its current complexity. We're here instead of being potentialities in a uniform void. So, something broke that symmetry. Physicists call some of the random fluctuations that break symmetry "topological defects." In essence, topological defects are spots where something goes wonky in an otherwise-uniform field. All at once a disruption emerges. This can happen due to outside interference, like in a lab experiment. Or it can happen randomly and mysteriously, like scientists suspect happened in the early universe. Once a topoligical defect forms, it can sit in the middle of a uniform field, like a boulder creating ripples in a smooth stream. Researchers had previously created these sorts of defects in the magnetic fields of supercooled gases and superconductors in their labs. But the defects emerged individually. Most theories that use topological defects to explain the origin of the modern universe involve "composite" defects, Mäkinen said — more than one defect working in concert. Mäkinen and his co-authors designed an experiment involving liquid helium cooled to fractions of a degree above absolute zero and squeezed into tiny chambers. In the darkness of those little boxes, half-quantum vortices emerged in the supercooled helium. Phase transitions cause symmetry to break. For example, liquid water is full of molecules that can orient in many different directions. But freeze that water, and the molecules get locked in place in particular positions. Similar breaks in symmetry happen with the superfluid phase transitions in the experiments. Still, after the superfluid helium went through its phase transitions, the vortices remained — protected by walls bounded by strings. Together, the vortices and the walls formed composite topological defects and survived symmetry-breaking phase transitions. In that way, the researchers wrote in the paper, these objects mirrored defects that some theories suggest formed in the early universe. Does this mean that Mäkinen and his co-authors have figured out how symmetry broke in the early universe? Absolutely not. 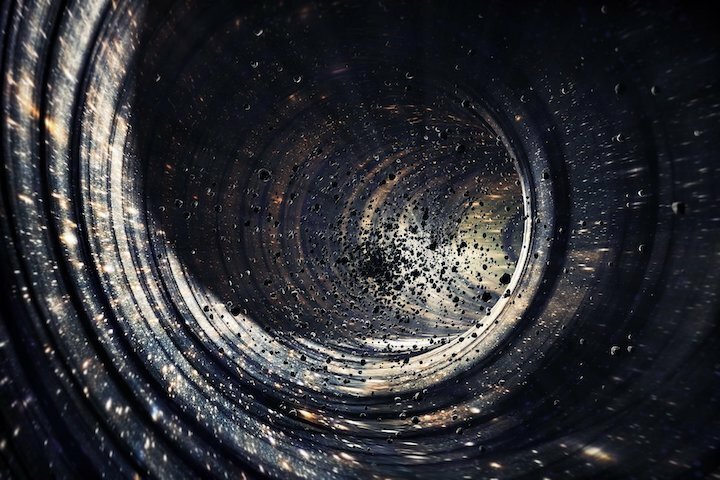 Their model showed only that certain aspects of "grand unified theories" of how the early universe took its shape can be replicated in a lab — specifically, the parts of those theories that involve topological defects. None of those theories are widely accepted by physicists, and this could all be a big theoretical dead end. But Mäkinen’s work does open the door to more experiments to investigate how these sorts of defects may have worked to shape the moments after the Big Bang. And these studies definitely teach scientists something new about the quantum realm, he said. The open question remains: Will physicists ever conclusively link these details about the tiny quantum world with the behavior of the entire universe?